It was inevitable, people. With all of the videogame nostalgia that’s built up over the last decade at some point someone was going to capitalize on it all with a cartoon. Somewhere like Adult Swim seemed like an obvious destination, but instead the job fell into the capable hands of Disney. 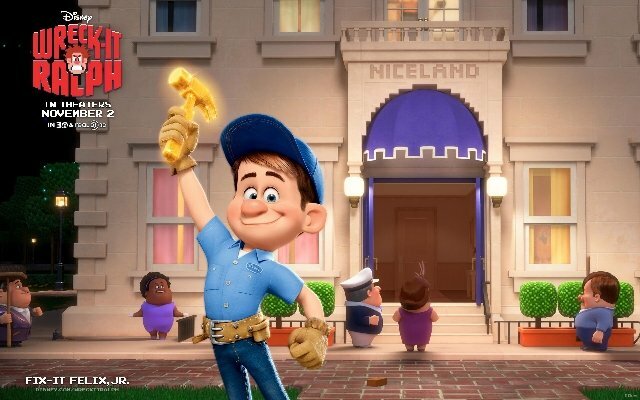 With Wreck-It Ralph, Disney’s new animation division (led by the more-than-capable hand of Pixar founder John Lasseter) has announced their presence as Pixar-light. The dedication to strong storytelling, relatable characters, and high concept ideas is there (much like they have been in all of the Disney heydays), but it comes in a slightly less rounded and more commercial package than taking a straight hit off the Pixar pipe. Wreck-It Ralph is essentially Toy Story remade for the videogame generation with-wall-to-wall in-jokes that veer into the realm of product placement. There’s plenty for cynics to scoff at, but the warm n’ fuzzy Disney center, strong comedic performances from the all-star voice cast, and the gaming nostalgia whipped up by folks who clearly cashed in most of their allowance at the arcade are enough to make this flick pure pleasure for any child or overgrown child in love with videogames (aka you, the one reading a videogame site). The film takes place in a magical world where not only do arcades still exist, but the characters from those quarter-eating machines spend their off hours hanging out in the power bar. One of the most popular vintage games in arcade is Fix-It Felix Jr., a Donkey Kong knock off with a big hulking monster man named Wreck-It Ralph (John C. Reilly) who destroys a building that can then be fixed by the player as Fix-It Felix (Jack McBrayer). Of course, the life of a videogame villain ain’t easy and Ralph spends his nights sleeping on a pile of garbage while Felix parties it up with the people he saves day-after-day. 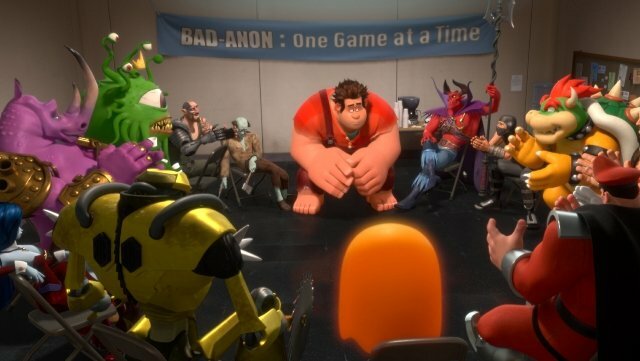 Ralph tries to console himself with meetings at a videogame villain support group with the likes of Bowser, Kano, Zangief, and zombies, but it never works. One day he decides to abandon his game to find a home elsewhere and after a failed experiment in a first person shooter called Hero’s Duty, he ends up in a Japanese teeny-bopper racing game called Sugar Rush. There he befriends a little girl named Vanellope von Schweetz (Sarah Silverman) who is desperate to become a racer even though she’s also a programming glitch that might ruin the game. Ralph has to battle Sugar Rush’s villainous Ed Wynn-style dictator King Candy (Andy Tudyk) while meanwhile Fix-It Felix sets out to find Ralph to prevent his game from becoming out of order and finds a search partner/possible life partner in Hero’s Duty’s lady leader Sergeant Calhoun (Jane Lynch). So yeah, there’s your story. Wreck-It Ralph is fairly straightforward and all builds towards one of those “learn to love yourself” messages like so many animated films before it. But while the screenwriter’s won’t win any awards for great innovation in children’s storytelling, they picked a formula that works and execute it well. The emotional beats are sound and the tear-jerking punch comes through right on time. What makes Wreck-It Ralph a rock solid work of children’s entertainment comes on the comedy side of things. Longtime Simpsons director Rich Moore knows his way around anarchistic animated comedy and parody, which he applies to the videogame world with prankster glee. The sight gags of Ralph drinking a night away at Tapper, Q-bert struggling to communicate, or Kano ripping out a zombie’s heart while trying to prove he’s an emotionally stable guy hit the mark just right. The designers clearly love their games and fill the movie with references and in-jokes like cleverly having the Wreck It Ralph side characters move in jittery, limited, 8-Bit style animation or having Ralph remark on how pretty and “HD” Hero’s Duty appears. It’s all ultimately fluff, winks, and nods to the audience, but done by fans and done well. Even though the story and message are geared at Disney’s target youngsters, there’s enough here for the film to appeal to the every-growing army of videogame fanatics, provided they know they’re getting into a children’s picture. That cross-audience appeal clearly came into play when casting the voice actors as well. It’s just as unlikely that any youngster watching the film will know who John C. Reilly and Sarah Silverman are as it is that they’ll pick up on a killer M. Bison joke. These folks were cast for parents and slumming 20something viewers…well, and also the fact that they are ideally suited to the roles. Reilly does his lovable loser thing well (even though his Steve Brule-style comedy eccentricity is missed), Sarah Silvemarn’s voice works so well as a little girl that it’s odd no own thought of it before (maybe it was all that filthy comedy), while Comic-Con fav Andy Tudyk delivers a hysterical Ed Wynn impression as the villain that will be funniest only to those who know the sexually ambiguous 50s comic. The cast MVPs are definitely Jack McBrayer and Jane Lynch whose star-crossed gaming love story is the comedy highlight with large chunks of dialogue clearly improvised by the Second City veterans. The voice work is matched by some truly gorgeous CGI animation that mimics all of the required videogame styles well and uses the virtual camera in a very cinematic way (both probably coming out of Moore’s extensive experience on the Simpsons). The animation quality is of course a step below what the Pixar wizards whip up every year, but it also makes the likes of Hotel Transylvania look like direct-to-DVD CGI cheapie. Wreck-It Ralph is not a masterpiece, nor is it the definitive videogame movie for the addicted controller-clutching masses (that’s still The Wizard, folks). However, it is a perfectly pleasant piece of crowd-pleasing Disney entertainment. Kids will get wrapped up in it, while their parents will enjoy the voice performances and playing spot-the-videogame reference. 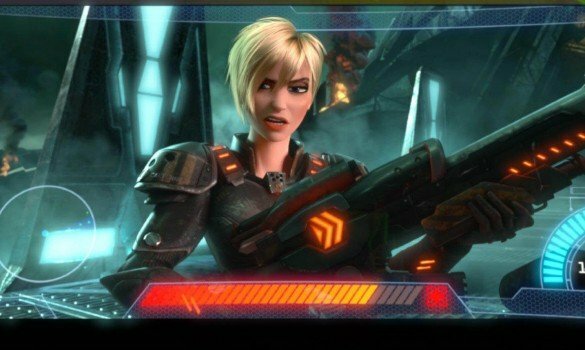 At times the movie feels more like an advertisement for gaming (Wreck-It Ralph tie-in games are in stores now kids!) than a loving tribute (like say Who Framed Roger Rabbit was for cartoons). Few of the characters referenced were actually associated with the arcade era and the parade of inside jokes (like a safe opened with a familiar NES code) can get a little tiresome after a while. But at the same time, no one has done a loving gaming tribute this well before, so it’s hard to nit-pick too heavily. In the end, this might just be a decent children’s animated feature with a fresh gaming setting, but that’s enough to make it stronger than most of the kiddie CGI faire seen these days. It’s a strong showcase for Disney to prove they can do more than just release Pixar movies and should tickle any videogame fan who goes in with reasonable expectations. 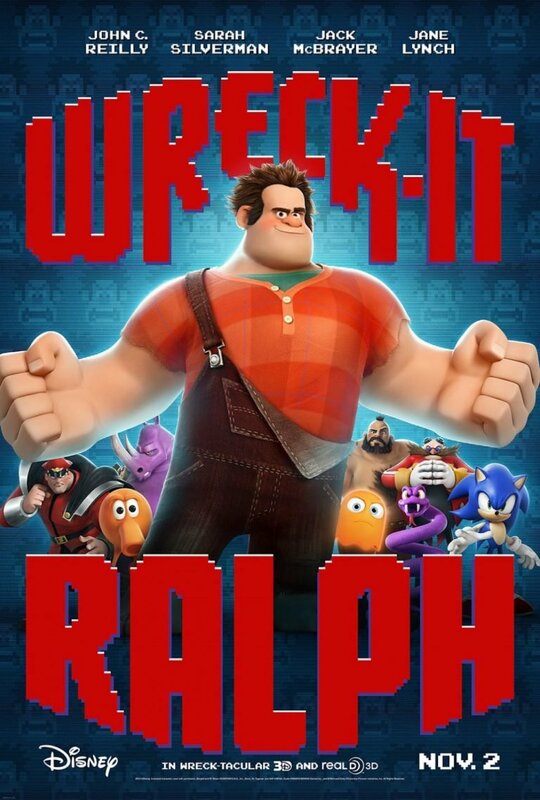 That’s more than enough to make Wreck-It Ralph a worthwhile family film. Expecting more would be like expecting to beat Ghosts n’ Goblins on a single quarter. That’s just not being realistic. 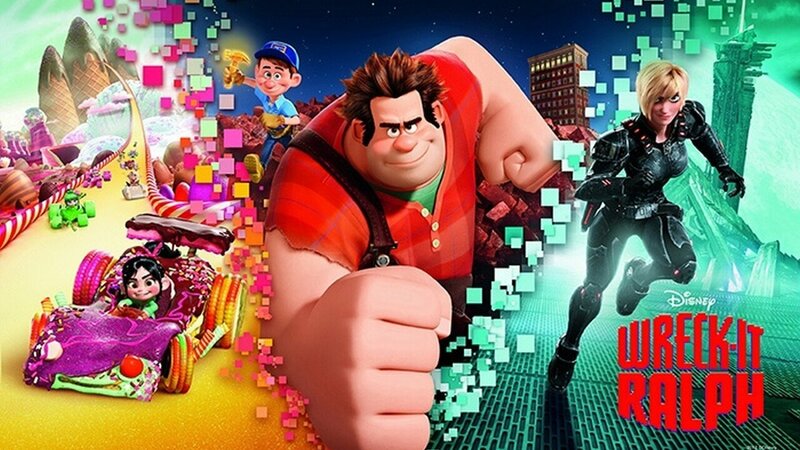 What makes Wreck-It Ralph a rock solid work of children’s entertainment comes on the comedy side of things.